Hello Friends, I have been eyeing the Verve August Inspiration photo the entire month and I am cutting it very close, as it is already the 30th of August! Can you believe it? Where on the earth has this year gone! Anyways, it has been a very crazy month here in the Leppek household. The moving trucks have left and my house echoes like crazy, but it is all good thing! My son is on his way to his new life in Seattle,Washington working at Amazon and hubby and I are adjusting to it being just the two of us once again. I can’t say I didn’t shed any tears when he left, but I am doing fine now! Well, until I find another sweet sticky note Ty has left me, hiding around the house. One of my favorites said this, ” I take home wherever I go, it’s filled with all the memories, laughter and tears of the last 23 years.” Now, tell me you wouldn’t have cried when you read that? I am one very lucky mother! Okay, back to the real reason you are here! Because life has been so busy, I took the liberty to CASE myself once again. I was invited to a 1 year old’s birthday party yesterday and this is the card I created for sweet Violet! In hind site, I wish I would have made it violet instead of pink, but I still had the extra pink ornaments and a pink Emery elephant already made in my stash that saved me some time. Here is the original card. I think using the Christmas Ornaments as a mobile and or decorations is a super way of using those Christmas Stamps year round. Few Card Details: The decorations were made with a Verve Christmas set called Holly Jolly Christmas. Little Emery the paper pieced elephant is also from Verve. The sentiment is half Verve (Happy) and Half Gina K.(Birthday). The dots EF is Stampin UP. Categories: Cards | Tags: Card making, Cards, Christmas ornaments, Happy Birthday, rubber stamps, stamping, Verve Stamps | Permalink. Adorable. Love your cute card and pretty colors. Cute birthday card for the first one. What a fun creative birthday card for a one year old. It will go into a scrapbook or at least, be kept in a memory box. One day the One year old will be a 23 year old who is moving away from home to a new life. Oh the memories! You just never know. Tears for sure. OMGee….that little elephant so wicked sweet! Super cute card! Oh, this is adorable! Love those paper lanterns! Thanks for playing along with our Diva Inspirations challenge! Emery is soooo cute on this card!! Great birthday card. Ty is just 3 hours away from me!! When you come and visit him maybe we can connect. There is nothing I would love more!! I will keep that in mind for sure!! I plan on spending next summer up there…. Fingers crossed!! 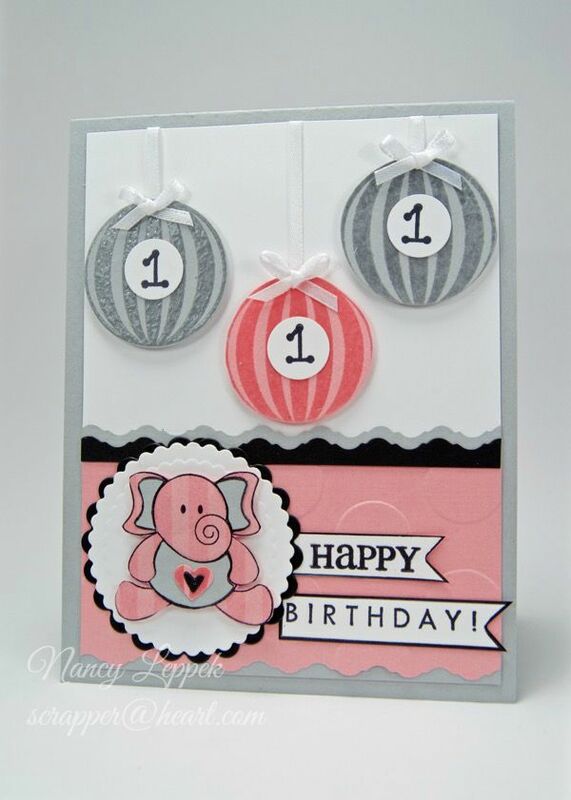 A very cute card and love the elephant.